If you want something besides branded luxe options and the shoes found at malls, drop by K Dayalana��sA� little store in Mahabalipuram. 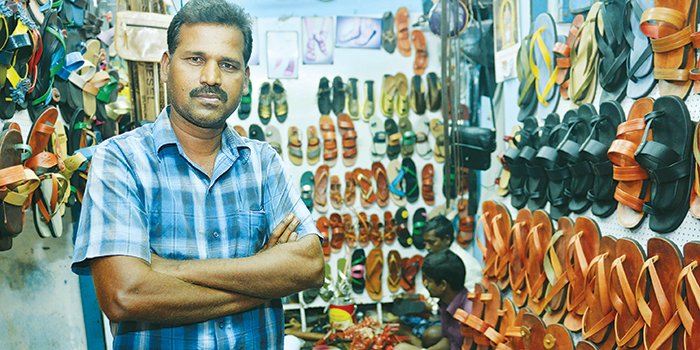 Over seven years in the business, the cobbler has been nurturing a clientele that includes foreign tourists, for his leather mules, bags and sandals. a�?I started off earning Rs5 a day, stitching shoes and bags. My uncle trained me and I worked for nearly 13 years near the Five Rathas, one of Mahabalipurama��s many monuments,a�? he begins. Currently, Dayalan makes Rs20,000 a month and has four workers under him. a�?I buy leather from Ranipet in Chennai and make shoes in at least 25 designs. I make them from what Ia��ve seen and learnt in the past. I use a lot of bright colours like pink, gold and red so the shoes stand out. Bright colours are always popular among expats.a�? The store also sells belts and wallets and allows you to customise. a�?Show me a design and within a week, we can make it for you,a��a�� he confidently says.